Never mind all this talk of walls; and never mind the fact that Matt Koch was actually putting up a fence when the idea was first put to him. Because here, in these notoriously fractured times, is a young Republican eager to build bridges. As co-owner of Shawhan Place, Koch was supervising a consignment at the Keeneland January Sale last week when breaking off to Frankfort to be sworn in as the new state representative for the 72nd District of Kentucky. The day after his election last November, similarly, it was at Keeneland that you would have found him, showing horses with his team. That’s how symbiotic is the connection he wants to maintain, not just between his professional duties and those he has embraced at the capitol; but also between the industry in which he was raised (and which, of course, employs much of his electorate) and the forum where the broadest interests of the Bluegrass are weighed. 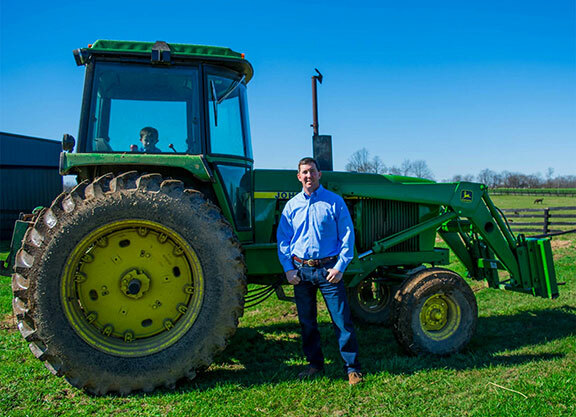 Koch is the first Republican to represent Bourbon County and its environs in the Kentucky House of Representatives since 1974–when the seat was held by none other than his partner in Shawhan, Teddy Kuster. And it was Kuster who accosted him just over a year ago, while Koch was busy digging post holes round the foaling barn, to lament that nobody had yet filed to run on the Republican ticket; and that there were now only a couple of days before the deadline. If he entered the field almost inadvertently, moreover, Koch could not have a more natural affinity with the concept of service. Even the current divisions infecting national political discourse, after all, are pretty trifling compared to the kind of thing Koch witnessed during his four-year stint as second lieutenant in the Marine Corps, when exposed to the volatile and violent theatres of Kosovo and Afghanistan. As an intelligence officer, Koch had to show wisdom beyond his years to make the best use of authority and responsibilities that would have daunted many an older man. So while the idea of “working a room” like a politician may remain alien, Koch is actually one step ahead. He wouldn’t do that because it’s expedient, but because it fits the way he has learned to deal with problems. Nor is it as though these seeds were ever falling on fallow soil. Koch is indebted to parents who raised their many children to have a sense of social duty, an instinct for giving something back. His father, of course, is Gus Koch Sr.–long-serving manager at Claiborne, and himself a Marine veteran. So the young Koch absorbed much of value, growing up on that storied farm, besides the horsemanship he has applied in his own post-military career. Despite a battle with cancer extending nearly two decades, Koch’s father remains a daily sounding board in the professional dimension to this living legacy. That traces right back to his boyhood, and the great Moccasin: only 2-year-old filly to be named Horse of the Year and, along with her sister Thong, one of those who immortalised their dam Rough Shod II. His favorite job was to hold tools for the farrier and, after himself learning the art of shoeing, he paid his way through the University of Kentucky trimming mares. After his military service, his father sent Koch to Teddy Kuster and together they started the Shawhan consignment in 2006. Daniel Shawhan bought the land in 1788 after sampling what he declared to be the cleanest spring water he had ever tasted and promptly built a distillery. The same water, and the limestone pasture, quickly put the latest Shawhan venture on the map. After a $7,000 purchase named Queen Randi (Fly So Free) threw a stakes winner, client Jeff Anderson was emboldened to mate her with Mineshaft (A.P. Indy). The result was Fly Down, who finished second in the GI Travers S. and GI Belmont S. and third in the GI Breeders’ Cup Classic. From breeding half a dozen mares in its first year, Shawhan now processes sufficient numbers for Matt to supervise the breeding and foaling; and brother Gus Jr., the babies and breaking and sales prep; while Courtney Schneider serves as director of sales. “But we’ve learned that where we have most success is that when the clients call us, we’re the ones to answer the phone,” Koch stresses. “We’ve tried a bunch of things, but learned that big numbers weren’t the way to go. A lot of our clients just have one or two mares–but when they call us, they know that either myself or Gus or Courtney has handled their horse that day, and can talk to them about it. We’ve kind of learned that’s where our niche is. Here’s a regular guy, then: married to a schoolteacher, a father of three, determined to stay attuned to the hopes and fears of his constituents, regardless of formal political allegiance. He’ll not charge in promising to change the world overnight, but he’ll quietly make it his business to figure who does what at the capitol and who needs what back in the 72nd District. Personal, daily exposure to the challenges that count for so much in Bourbon County, however, is only one guarantee of his eligibility. The other is that grounding: first of all from one of the most respected horsemen in the Bluegrass, and then from military mentors. While he shows the Marine’s habitual reluctance to dwell on the dangers he endured, he does acknowledge the power of the experience. “You do grow up,” he reflects. “I mean, you’re looking at young men and women in their early 20s, corporals and sergeants, in charge of armory that’s worth $8 million. Or they’re out there leading squads, actually in charge of human lives. It’s so much responsibility that coming home is sometimes a let-down. I think that’s why a lot of veterans have a hard time when they return.